George Baker is a former city trader turned racehorse trainer, and he has made a pretty successful transition. With less than ten years’ experience under his name, Baker has amassed a reputation as a shrewd operator who definitely doesn’t mind a tilt at the betting ring. He trains both Flat and National Hunt runners and has a very solid overall strike rate of 13.3%. In this article we take a look at how Baker’s runners perform based on a range of variables – course, class, race types break between runs etc. They have a higher strike rate, and produce a positive A/E. Admittedly he doesn’t have many 3 year old runners in all age handicaps before July, but when he has only had 2 winners and 5 places from 46 runners in that time. In the first half of the year, Baker’s older handicappers win at a solid 13.92% rate, but marginally underperform market expectations, producing an A/E of 0.95. However, from July onwards, they really get into full swing, producing positive A/E’s in 5 of the 6 months, giving overall figures of 63/378 (16.67%) for £125.55 LSP, A/E 1.39 from July-December. His strike rate at Goodwood, Brighton and Nottingham is especially good. There is no surprise that his record at Salisbury, Doncaster and Sandown is poor, as races at the tracks are usually very competitive. Baker has the majority of his runners in the lower grades, with most coming in Class 6 company. His strike rate is good in the lower grades and he produces a positive A/E. When his runners go higher than Class 4, their strike rate naturally dips, and their A/E is below 1. Lower grade races are typically easier to win, and Baker is a good placer of horses, so it figures that he does well in the uncompetitive races. Similarly in sellers, Baker has a very good record – 31/98 (31.63%) for £16.90 LSP A/E 1.21. This further reinforces the view that he has a good idea of the form book and where he needs to place his horses so they can get a win under their belt. Baker’s last time out beaten favourites have a good record when returning to the track; 41/198 (20.71%) for loss of £-5.13, giving an A/E of 1.19. When they turn out within 2 weeks of reversal, their record gets better; 18/59 (£30.51) for an A/E of 1.44. He rarely leaves the money behind twice. Baker has a modest strike rate with his 2 year old debutants, but most go off at big prices. They improve significantly for their first start and when fancied next time out are very profitable. His 2 year olds do very well in sellers. 3 year old maidens aren’t really Baker’s forte, and he only has a handful of newcomers each season. His 3 year old handicappers in 3 year old+ company do much better from July onwards. His older horses also better in handicaps during the second half of the year. Goodwood and Brighton are where Baker’s 3 year old+ handicappers do best. Both of these courses are undulating in nature. He has a higher strike rate and better A/E in the lower grades, with most of his runners competing in Class 6 handicap company. 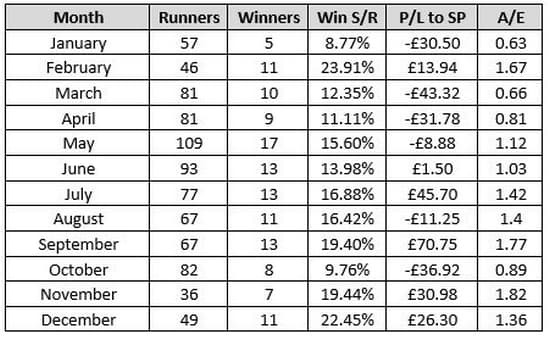 Baker has a very good strike rate in both sellers and claimers, especially when his runners are fancied. When a beaten favourite last time out, Baker’s runners do well. They have an especially good record when turned out within 2 weeks of their previous reversal. While his flat runners do better in the second half of the year, the opposite is true of Baker’s National Hunt runners. They do best in January-June.